Our campground is divided into two sections; Marina Point and Park Side. 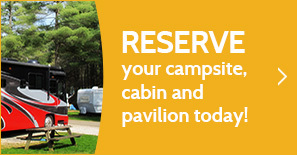 Choose from almost 150 campsites that are available online plus 12 primitive campsites that are for tents only. Park Side offers a beach that is open Memorial Day weekend through Labor Day weekend. We have a beach volleyball court, kids playground, basketball courts, and walking trails. Boat rentals are available at the Marina. The Dockside Restaurant is open from April 18th - ? and is conveniently located at the Marina also.